I bet you thought Meil Armstrong and Buzz Aldrin were the first men to walk the Moon. 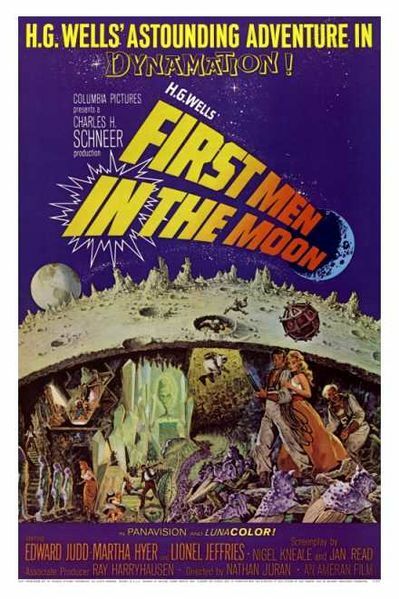 But this film tells the true story of the FIRST MEN(and woman) IN THE MOON. It happened in the year 1899. Joseph Cavor(Lionel Jeffries) is the man who invented Cavorite, a substance with a helium base. It cuts gravity. He’s built a sphere coated with his Cavorite and uses shutters over the portholes to direct/steer his spaceship. Arnold Bedford(Edward Judd) is his neighbor, a businessman who is not quite as successful as he’d like to be. He has a number of creditors hounding him. Kate Callender(Martha Hyer) is his fiance. Cavor wants to buy the cottage from Bedford, offering two thousand pounds(the thousand American). Bedford gets Kate to assume ownership to sell to Cavor with a specious story about not wanting to his creditors to know he’s come into money. She learns the truth shortly when lawyers representing the real owner show up with a summons to court. Cavor has proven his claims and Bedford wants in, imagining all sorts of commercial uses for Cavorite. He thinks his little claim about a trip to the Moon is a wish fantasy until he sees the sphere. He decides he wants to go along and Kate gets pulled in when she comes to complain about the lawyer and Bedford has to pull her into the sphere just before take-off. They land on the Moon and don their spacesuits, leaving Kate in an airtight locker when they go outside. The suits are old style deep sea diving outfits. I was amused to see their hands uncovered, merely airtight cuffs around their wrists. And Kate pops out of the airtight much to quickly for the sphere to have refilled with oxygen. They discover an underground civilization of insect-like creature, Selenites, and a mixture of primitive(spears) and technological machines(a sort of ray gun that kills a huge caterpillar creature used as a meat animal, as well as an x-ray machine that reveals Kate’s human skeleton). They fight their way free as Bedford reassembles the sphere the creatures had begun to take apart and take off for Earth. Cavor, in typical mad scientist mode, stays behind to “communicate and learn” from the Selenites. We get some clue about what is to happen as he coughs a few times while ascending a long set of stairs. The whole thing comes to light when the first expedition to the Moon, a U.N. one, finds the Union Jack and a note claiming the Moon for Queen Victoria, It had been written on Kate’s court summons and that’s used to find Bedford in a retirement home, who tells them the story. The whole tale was told in flashback. 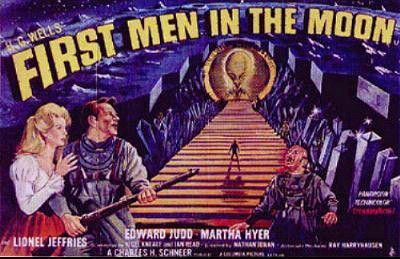 The film was based on the H. G. Wells novel THE FIRST MEN IN THE MOON. Effects great Ray Harryhausen created and made them move the Selenites and the giant caterpillars.